Haringey Council leader Claire Kober has announced she is quitting after almost 10 years in the role. A terrified driver battled through an angry mob of protesters as some kicked and threw objects at his car. A 'sexual predator' who posed as a cab driver and attacked a woman passenger has been jailed for four-and-a-half years. A man in his 60s has been injured in a hit-and-run involving a car being pursued by police, the second such incident this week. Police are looking for two men after a teenage girl was allegedly raped near a playground in Haringey, north London. The victim, who is in her mid-teens, was allegedly attacked on the 12th March at 9pm near to the playground an exercise equipment in Ducketts Common Park. One of the men is described as black, of large build with an afro and aged about 18-years-old. The other man is described as black, also of large build and 18-years-old. It is thought that he was wearing a puffa coat, possibly with a Nike logo on the front. A 14-year-old boy last seen in Waltham Forest has gone missing. 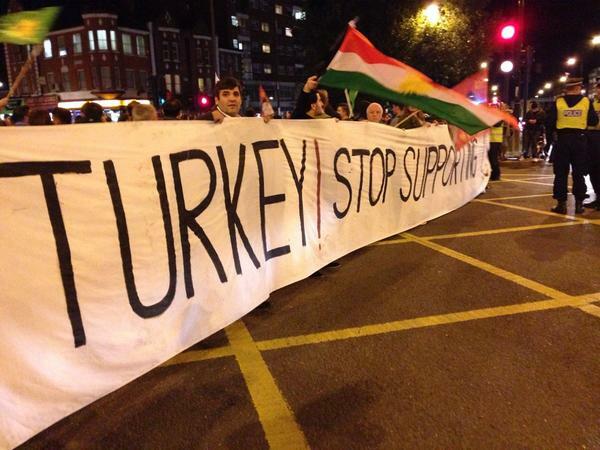 Tonight a protest by Kurds in London accusing the Turkish government of supporting IS has closed roads and caused massive delays to traffic between Hackney and Haringey. Organisers on Twitter claim between 3,000 and 4,000 people are taking part - but police would not give an official estimate. The Met say officers from the two boroughs are attending the protest but no arrests have been made. Haringey police are appealing for witnesses and any information concerning the burglary of a military supplier in N15 yesterday at 17:50. An assortment of nine ceremonial garments and two silver Household Cavalry helmets were stolen. The combined value of these items is in excess of £60,000. Officers are keen to hear from anyone who is offered these items for sale or who has information concerning the theft. Police say they are concerned for the welfare of Brian Playforth, a 66-year-old man, who has gone missing from Haringey. He was last seen on Wednesday, 9 July. Scotland Yard says he likes to walk in parks and open spaces and can easily become confused and disorientated.